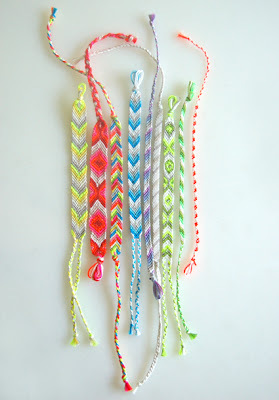 Macraméd friendship bracelets were all the rage when I was growing up in the eighties. 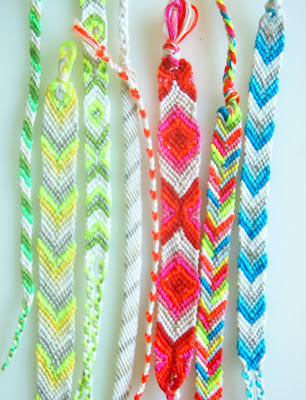 All the girls at my school would obsessively make them for one another in a dizzying variety of colors, widths, and patterns. It's amazing, thinking back, that such young girls could make such beautifully intricate accessories. I, of course, tried my hand at making them as well. 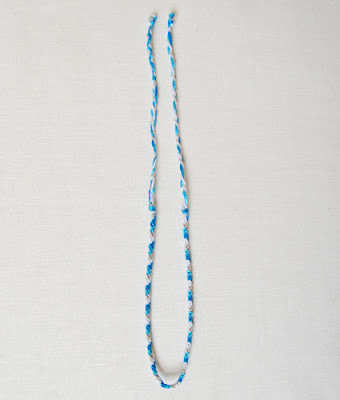 I would ride my bike down to the five-and-dime store and pick out the most sophisticated color combinations of embroidery floss I could find, but when it came to the actual macramé I never got beyond plain stripes. There was nothing wrong with plain stripes, except that the other girls seemed so much more advanced with their diamonds and chevrons. A bit intimidated, I never did become a big friendship bracelet expert. 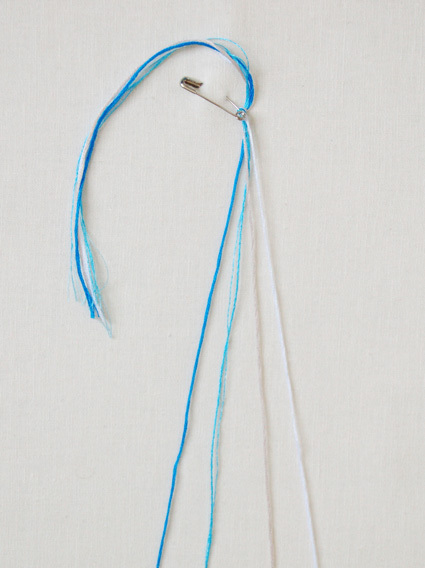 Fast forward 20 years: Purl Soho started carrying DMC Cotton Embroidery Floss in every conceivable color (including fluorescents! ) and so, clearly, my time with friendship bracelets had finally come! After a bit of research, I discovered that what had eluded me as a child is actually really simple. It turns out that there are only two major friendship bracelet knots, a right knot and a left knot. That's it. After all these years, they only took me a few minutes to learn! Making friendship bracelets is a surprisingly easy craft, and best of all, in the end you'll have a bunch of cute summer bracelets to give to your pals. 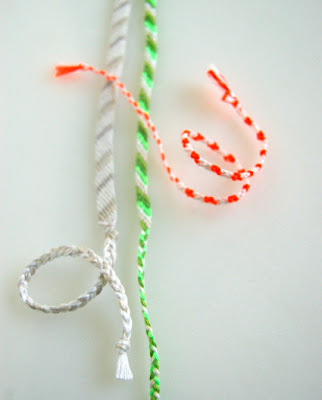 These are also a great thing to make with kids because they don't require any pins, needles, or scissors, and you can make them as simple or as complicated as you want. Once you learn the basics there's no limit to the beautiful patterns you can create! Since this is such a free form enterprise the amount of colors of DMC embroidery floss you get is really up to you. 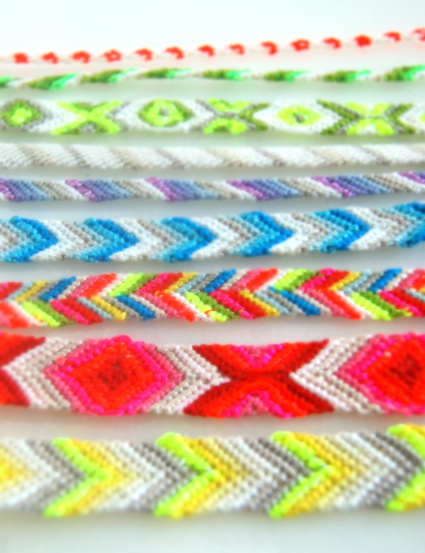 We used a package of the DMC Light Effects Fluorescent Embroidery Floss and then picked our individual colors around them. Here is a list of the individual colors we used: Ecru, Blanco, 155, 156, 157, 307, 445, 453, 606, 648, 666, 712, 746, 906, 907, 956, 3033, 3761, 3843. 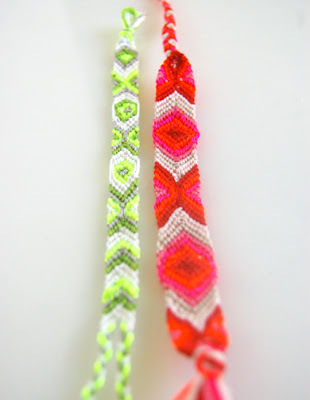 For our full selection of DMC Embroidery Floss click here and for the fluorescent pack click here. Please not that the fluorescent thread is slightly thicker than the regular DMC floss. So if you are mixing the two together it works best if you pull out and discard one ply of the fluorescent thread. To begin, pick out your colors. For the purposes of this how-to and the following patterns each color will be assigned a number. For patterns use a doubled length of thread cut each color to a length of 72-inches. Hold the cut pieces together, fold them in half, and then make a 3/4-inch long slip knot at the fold. Using a safety pin pin the loop to your jeans (or any other stable piece of fabric that you don't mind getting holes in) to keep it steady. 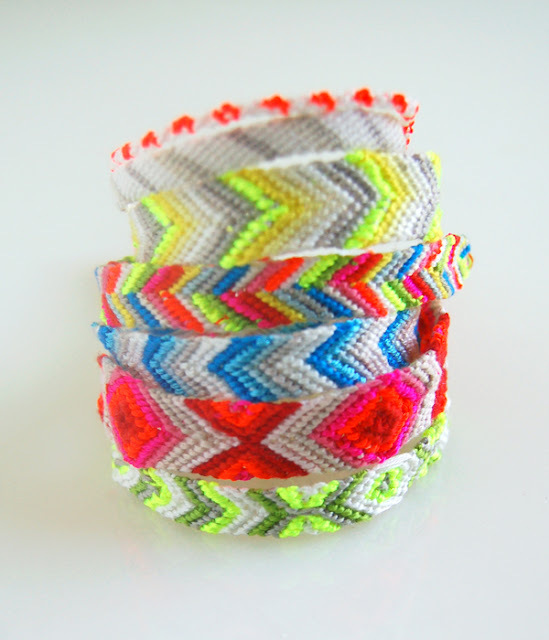 For patterns that use a single length of thread cut a 36-inch length from each color. Arrange the pieces in the proper order. Leaving a 6-inch tail, tie a simple overhand knot to start. Pull the end of the thread through this "4" loop creating a knot. 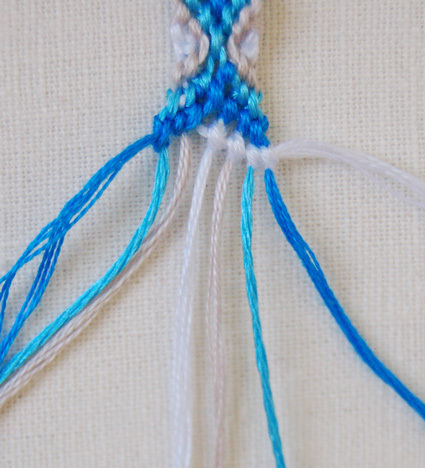 While holding the right thread taut pull up the left thread to form a tight knot as shown above. Repeat once more. 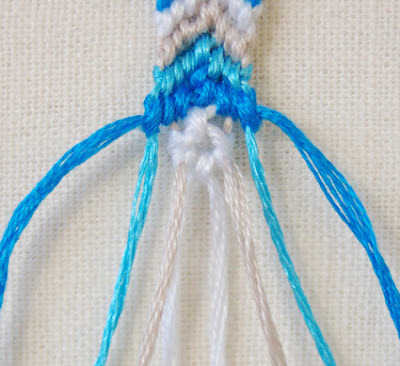 Both the Left and Right Knots are actually made up of two knots each. 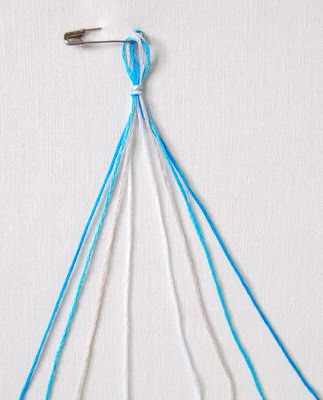 If you are tying more than one Left Knot in a row you will use the same thread (in this case thread #1) to tie the subsequent knots along the a row from left to right. 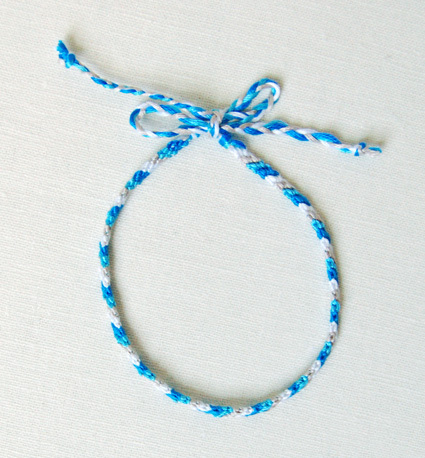 The right knot is made in the same manner as the left but in the opposite direction. Place a piece of thread over its left hand neighbor in the "P" shape shown above. 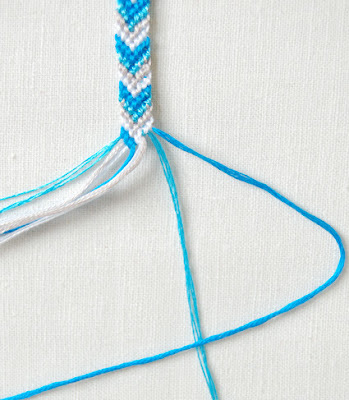 Pull the thread's end through the "P" to form a knot. 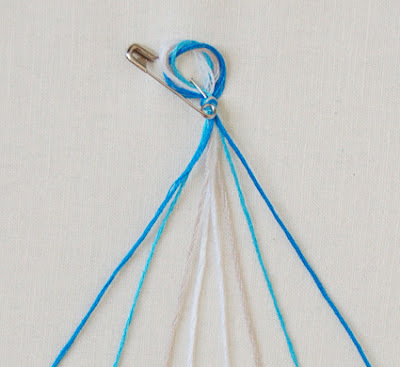 While pulling the left thread tightly down pull the right thread up to form a taut knot. Repeat this once to make a full Right Knot. 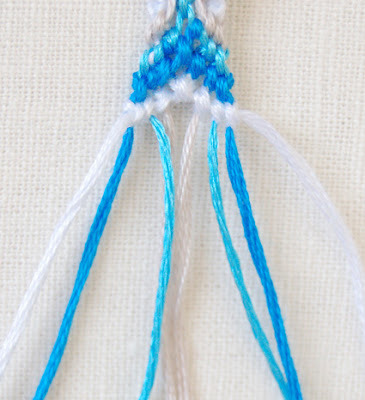 Remember both the left and right knots are actually made up of two knots each. If you are tying more than one Right Knot in a row you will use the same thread (in this case thread 1) to tie the subsequent knots along the row from right to left. 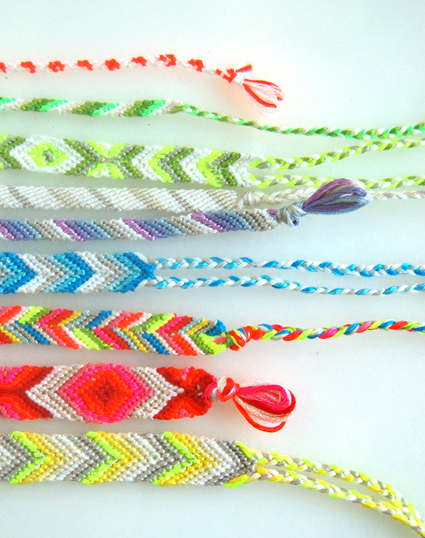 There are a couple of good ways to end your friendship bracelets. 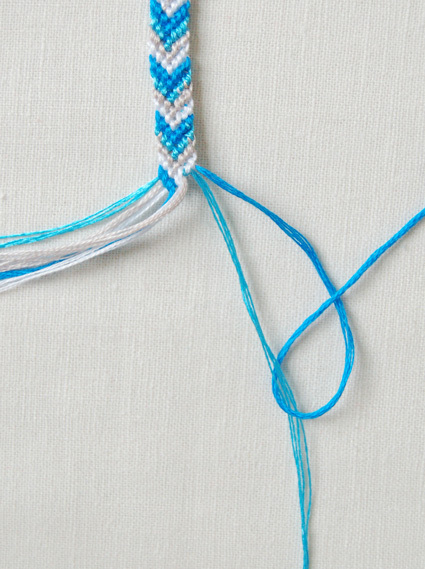 To end a bracelet that starts with a loop separate the threads into two equal groups. Braid each group and tie a knot at the end trimming the ends to be neat and short. To wear pull the ends though the starting loop and tie a knot. 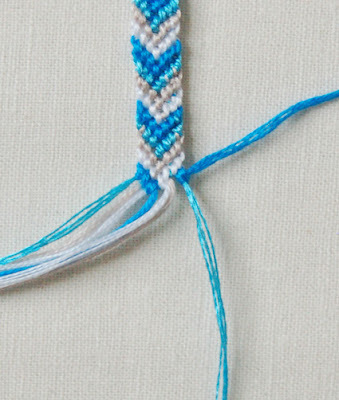 To end a bracelet that starts with a knot tie another knot at the end of the macramé. 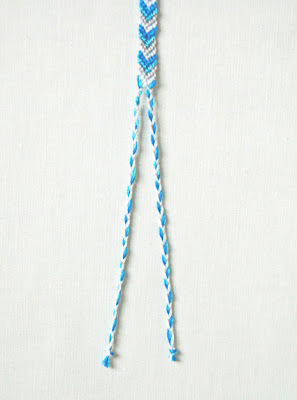 Braid both ends and tied knots. Trim to ends to look neat. To wear tie the ends together in a bow. 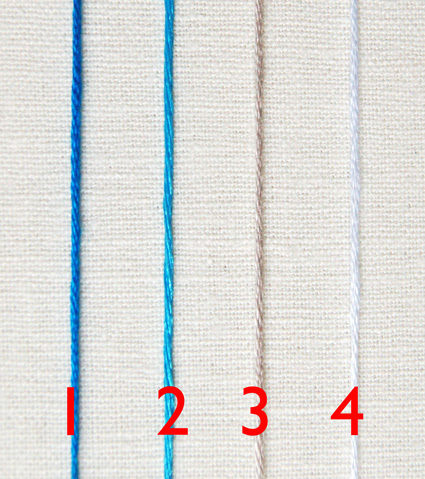 Use a single length of thread and any amount of colors you like. Arrange the color in a pleasing order. Starting at the far left tie a row of Left Knots using the 1st color across the whole width of the bracelet. 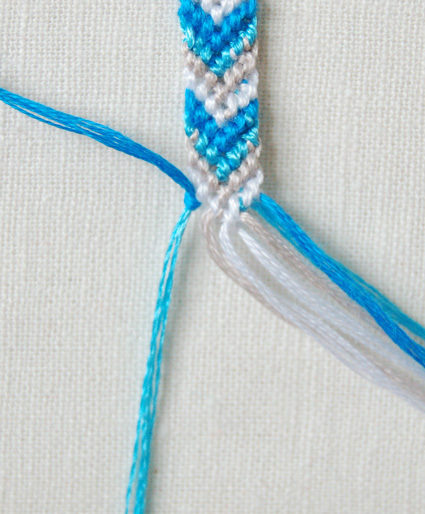 Repeat step 2 until the bracelet is the desired length. Using doubled thread and at least 3 colors arrange the threads in a mirror image. For instance, if you were using six colors as in the example above you would arrange the threads like this: 1, 2, 3, 4, 5, 6, 6, 5, 4, 3, 2, 1. 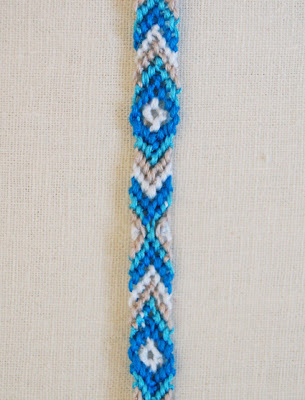 Starting at the far left side make a row of left knots stopping in the middle of the bracelet when the colors start repeating. For instance, in the six color example above you would tie five left knots. Starting at the far right side tie a row of right knots to the middle. When you get to the middle of the bracelet you will meet up with the thread from step 2. Tie this with a right knot as well. 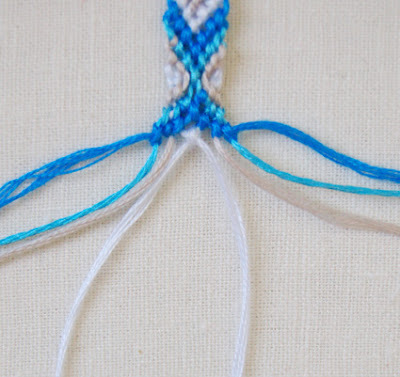 You will always be tying one more knot in step 3 than in step 2. 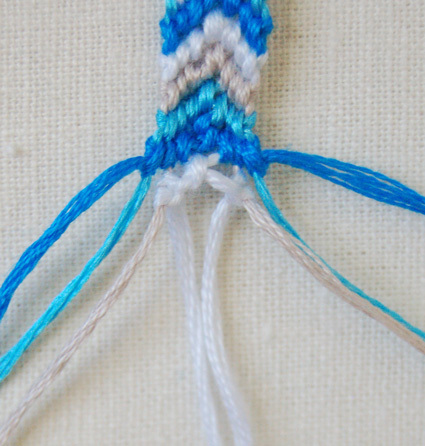 For instance in the six color example above you would tie six right knots in step 3. Repeat steps 2 and 3 until the bracelet is the desired length. 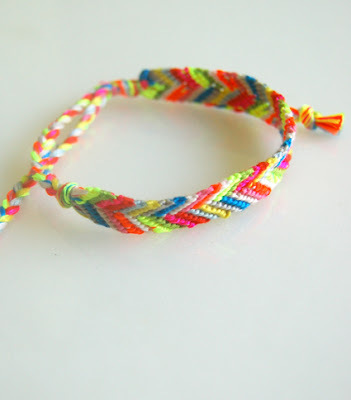 As another option you can change the arrangement of the threads in step one to make a more varied and braided looking bracelet. 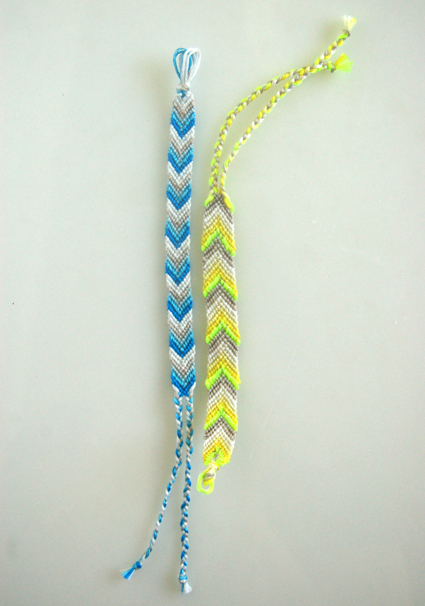 The diamond shape is the most complicated one I tackled so here are a step by step instructions to make a 4 color bracelet. Once you get the idea with the 4 color version you explore thinner or wider versions as well. Here are the four threads and their corresponding numbers. 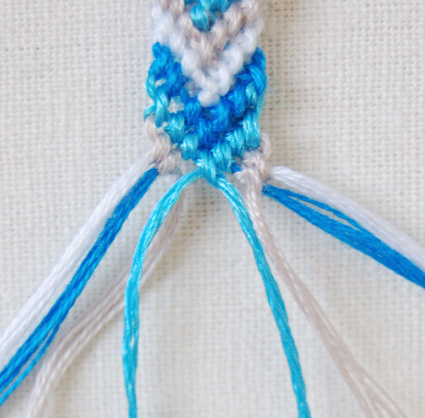 Start by tying a left knot with both strands of color 4 in the center. 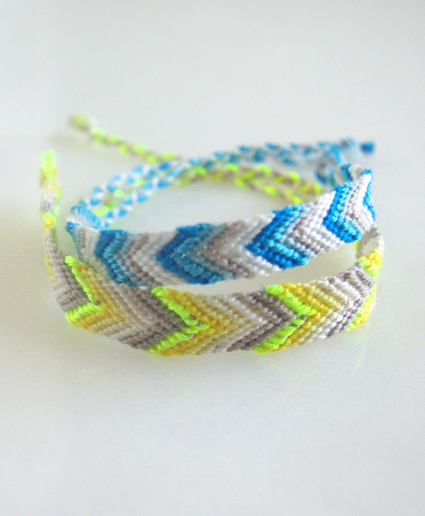 Please note, these photos start at the middle of the bracelet just because it's easier to see the pattern that way. 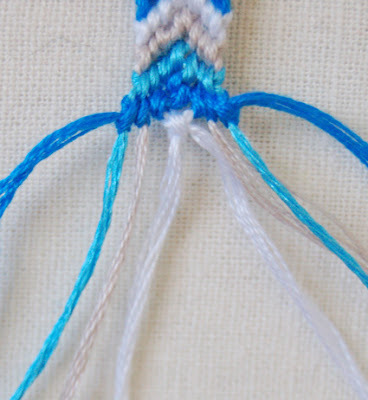 Then, starting with the right hand thread 4 strand tie a row of 3 left knots as shown above. 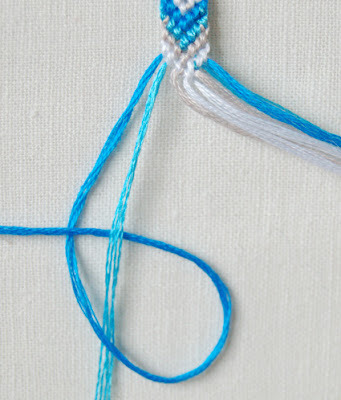 Next take the other thread 4 strand from the middle and tie a row three right knots as shown above. This shape will be called the upside down "V" in this pattern. In this same manner make upside down "V"s with colors 3, 2, and 1 always starting from the center and moving out. When you get back to color 4 make a left knot in the center. Using the right hand piece of thread 4 make a right knot with the thread directly to the right. 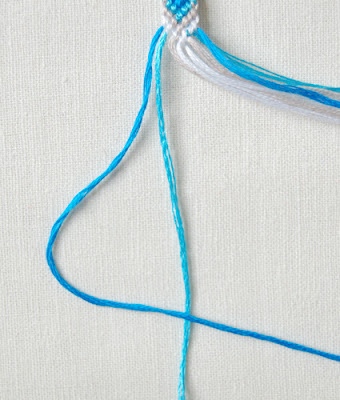 Using the left hand piece of thread 4 make a left knot with the thread directly to the left. 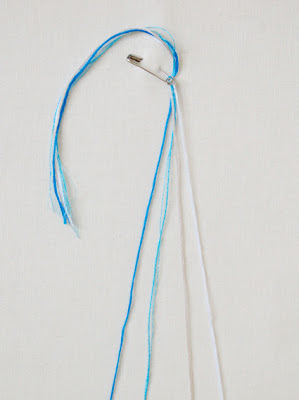 Tie the two color 4 pieces together with a left knot. 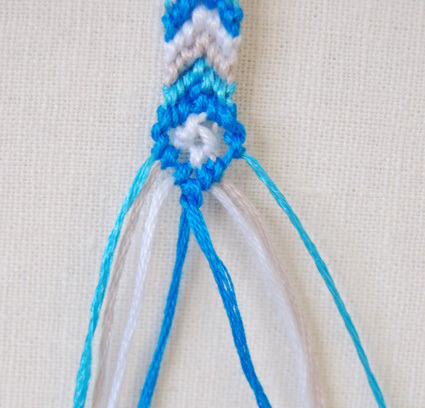 With color 1 make a "V" shape just as you would for the chevron pattern: Starting from the far left side tie a row of 3 left knots. Then, starting from the far right side tie a row of 4 right knots to form the "V" shape. Make another "V" shape with color 2. Starting at the far left tie two left knots with color 3. Starting at the far right side tie two right knots with color 3. 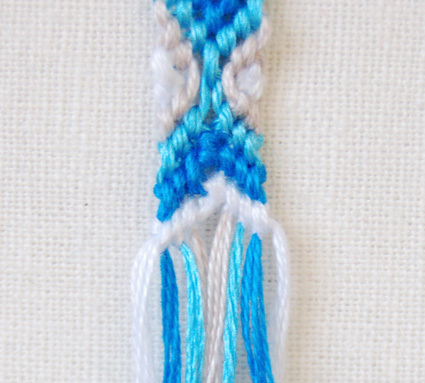 At the far left side tie a right knot with color 4. At the far right side tie a left knot with color 4. 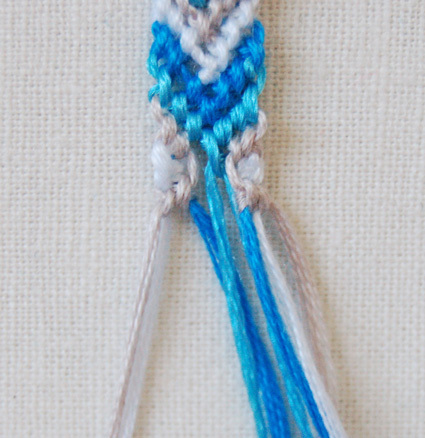 With the left strand of color 3 tie two right knots in a row to the strands of colors 1 and 4 directly the left. Do the reverse for the other side: with the right strand of color 3 tie two left knots. Tie an upside down "V" shape with color 2. Tie an upside down "V" shape starting with color 3. Now you're back at the beginning. 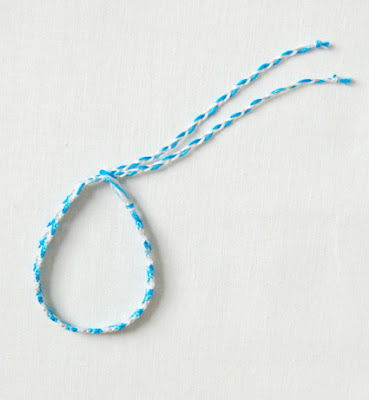 Repeat this until the bracelet is the desired length. Once you get the hang of all the patterns you can mix and match them like we did in the green bracelet above. Copyright by Wahyudikn. Powered by Blogger.